NETWORK FINALS: THURSDAY NIGHT FOOTBALL adjusted to 4.0, up 0.6 from CBS’s final game. In addition, THE BIG BANG THEORY gained 0.1. CABLE HIGHLIGHTS: NFL Network’s slice of THURSDAY NIGHT FOOTBALL was at 1.09, steady with its last shared game 2 weeks ago. TNT’s NBA doubleheader was at 0.81/0.58. USA’s CHRISLEY KNOWS BEST was at 0.47, compared to last week’s 0.45/0.43 double feature, and THE CROMARTIES premiered at 0.23. Nickelodeon’s SPONGEBOB was at 0.41. On Lifetime, PROJECT RUNWAY fell 0.09 to 0.39, and AMERICAN BEAUTY STAR ticked down to 0.09. MSNBC’s RACHEL MADDOW SHOW led the cable news demo race with 0.36/0.58/3M, over Fox News’s HANNITY at 0.28/0.47/3M, and CNN’s SITUATION ROOM at 0.19/0.24/1M. On ID. HOME ALONE slipped 0.03 to 0.29, and BLOOD RELATIVES was up 0.02 to 0.25. We’s TAMAR & VINCE returned at 0.28. Food Network’s BEAT BOBBY FLAY gained 0.03 to 0.27, and CHOPPED was up 0.02 to 0.23. On HGTV, HOUSE HUNTERS ticked up to 0.26, FLIP OR FLOP rose 0.02 to 0.24, and HOUSE HUNTERS INTL was down 0.05 to 0.23. History’s ICE ROAD TRUCKERS climbed 0.05 to 0.22. Bravo’s MILLION DOLLAR LISTING dropped 0.03 to 0.21, and REAL ESTATE WARS was down 0.03 to 0.12. Tru’s CARBONARO EFFECT returned at 0.18. FX’s BETTER THINGS gained 0.04 to 0.17. 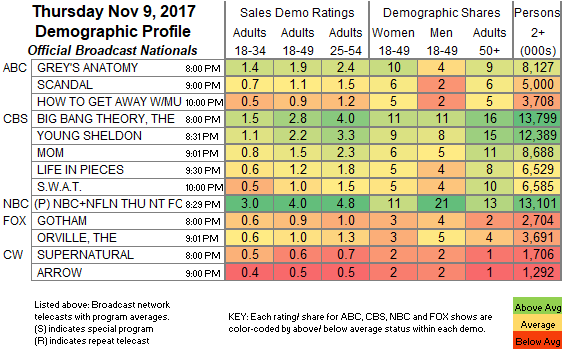 A&E’s THE ELEVEN climbed 0.04 to 0.17. 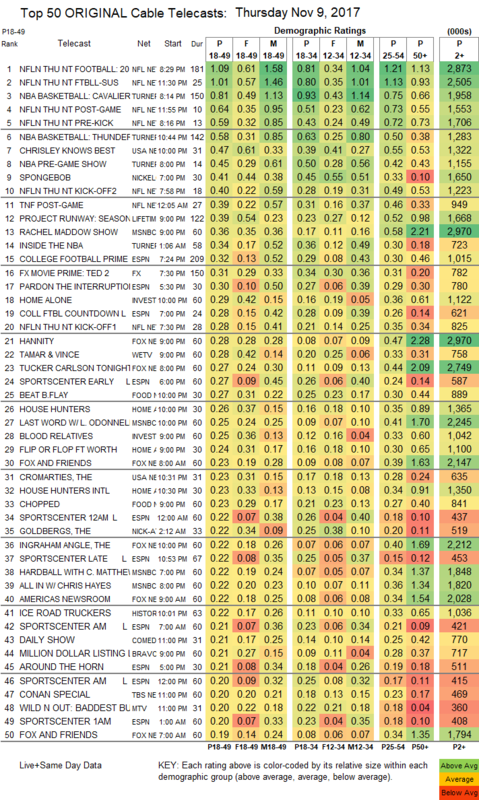 Comedy Central’s NATHAN FOR YOU was at 0.15/0.14, compared to last week’s 0.13. E!’s THE PLATINUM LIFE grew by 0.02 to 0.12. On Syfy, VAN HELSING fell 0.03 to 0.10, and GHOST WARS was down 0.02 to 0.06. POP’s IMPACT WRESTLING was off the chart, down 0.02 to 0.04/250K.